The latest member of our solar system to get a name is the dwarf planet Haumea, which wanders the Kuiper along side the other dwarfs: Ceres, Pluto, Eris and Makemake, reports Time. 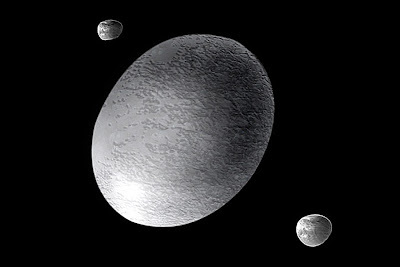 Haumea was actually discovered around 2004, and officially reported in 2005 by a Spanish team. However, a Cal Tech team claims to have found the dwarf planet earlier, but was delayed in reporting the finding due to "familial issues" affecting the lead astronomer, according to an entry at Wikipedia. Since the discovery, Haumea has turned out to be a peculiar subject. First of all, it rotates faster than any object larger than 100 kilometers across in our solar system. Humea spins on its axis once every four hours. It's also shaped like an egg. And astronomers think the two unusual features are linked to a large collision in Haumea's past. That collision, astronomers believe, also created the two moons that circle Haumea.